A new month, April has began, bringing with it spring, flowers, new beginnings and opportunities. 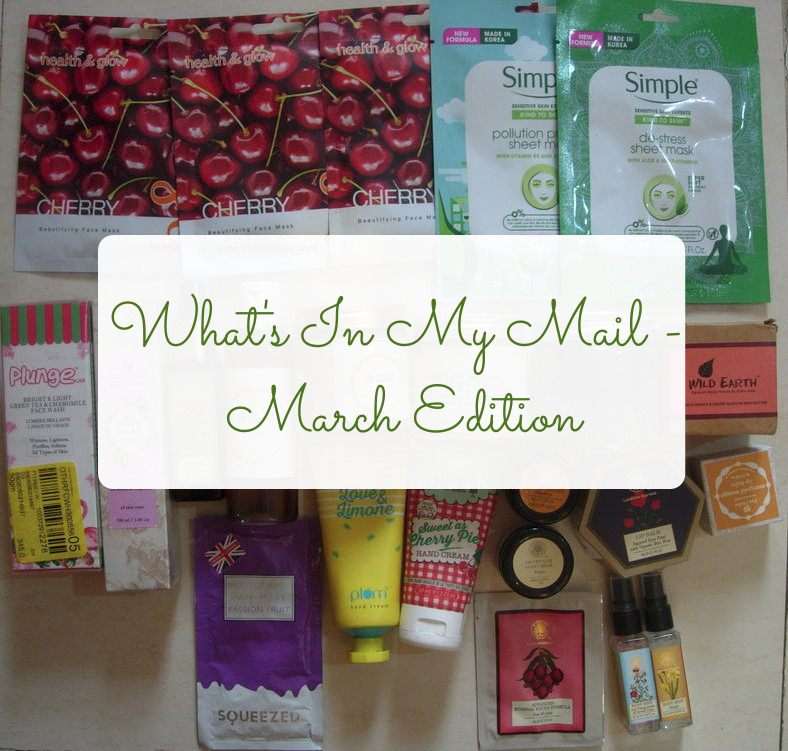 And its time for a What’s In My Mail – March Edition. If you are new to my blog, I would request you to check my previous What’s In My Mail posts – January Edition and February Edition. Basically, I just post all the packages that I have received in the previous month. It could me my own order, PR packages, gifts, gifts for others, etc. March was my birthday month. So it is going to be more special 😊. Let’s begin What’s In My Mail – March Edition. 1) Simple Skincare Sheet Masks (Pollution Protect one and Destress one) – much needed for this summers. 5) Nykaa Prive Member Birthday Gift – Nykaa sends birthday gifts for their Prive members if you order something on your birthday month. Above hand cream I ordered from Nykaa. I got a pink color travel pouch as my gift along with it. 1) Forest Essentials Sugared Rose Petal Lip Balm – This has been on my wishlist for a long time. Just look how cute the packaging is. I mean, which other brand has a mirror inside the lip balm case! 2) Forest Essentials Hasayan Rose Water Mist: This is a new launch by the brand. I have tried normal rose waters. I wanted to see how different Hasayan Rose was. So got the travel-size of it. 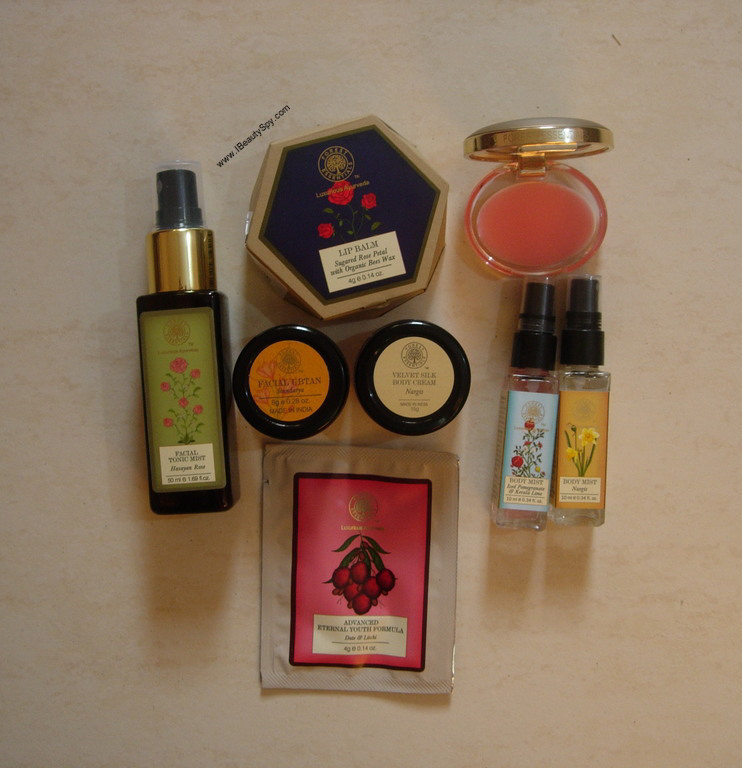 3) Forest Essentials Soundarya Facial Ubtan – This has so many good reviews. Again on my wishlist for a long time. Finally got a sample of it to try. 4) Forest Essentials Nargis Velvet Silk Body Cream – Nargis is their best-selling range. So looking forward to try. 5) Forest Essentials Iced Pomegranate with Fresh Kerala Lime Body Mist – This sounds so cooling and refreshing for summers. 6) Forest Essentials Nargis Body Mist – I love the tiny spray bottles of these two mists. 7) Forest Essentials Advanced Eternal Youth Formula Date & Litchi – Imagine applying date and litchi on your face. This is supposed to be a good anti-aging cream. Delighted to receive this as a freebie. 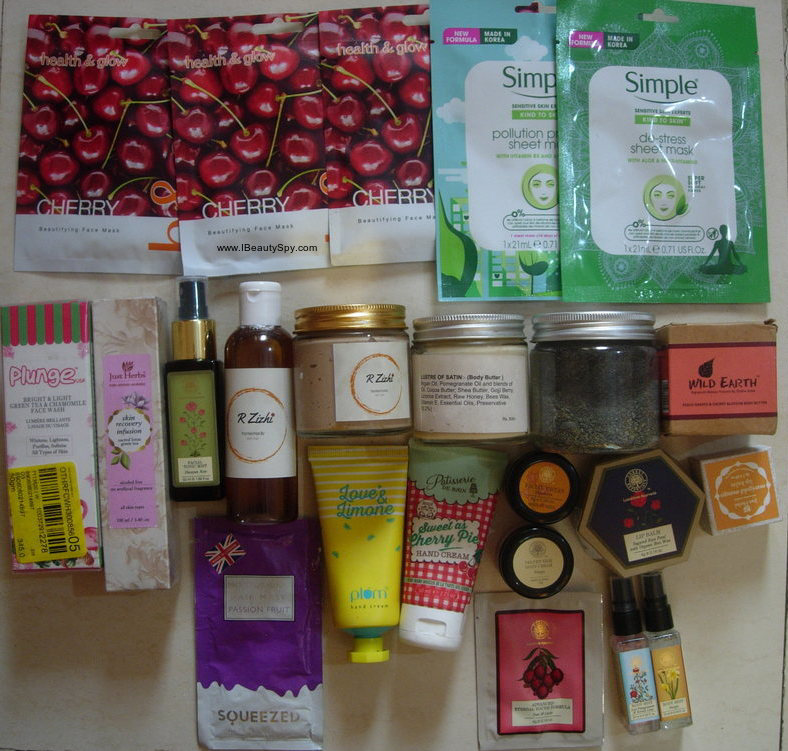 Thank you Forest Essentials for such a beautiful goodie bag of your bestselling samples. 1) Health & Glow Cherry Sheet Mask – This was on Buy 1 Get 2 offer. Yes, you get 2 free sheet masks with one. I have already tried this sheet mask 3-4 times in the past and really liked its effects. Also these natural variants from Health & Glow have clean ingredients list. They have advanced variants too. Like how Innisfree and The Face Shop has. But I didn’t find it much effective. But these natural variants – whitening cherry, detox pomegranate, oil control green tea & milk, nourishing thyme – they are really good. 2) Squeezed Passion Fruit Moisturizing Hair Mask – This is also a Health & Glow’s in-house brand. I have previously tried Squeezed Strawberry Extra Shine Hair Mask and liked it. Full review here. So got this passion fruit one to try. 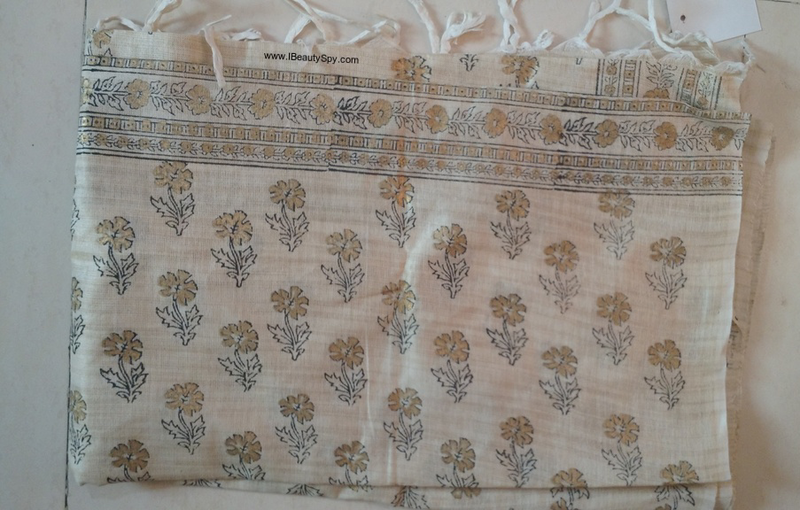 1) The Weave Traveller Handloom Hand Block Printed Khadi Cotton Dupatta – I ordered a shawl for my birthday dress. This churidhar was the last selected dress for me by my dad. So I kept it for a long time without stitching. After more than a year, I have got the courage to stitch and wear this on my birthday. Its a cream colored dress, so I got this cream colored shawl to go with it. This is pure cotton and the material is good quality. Better than what I expected. And the print is also nice. 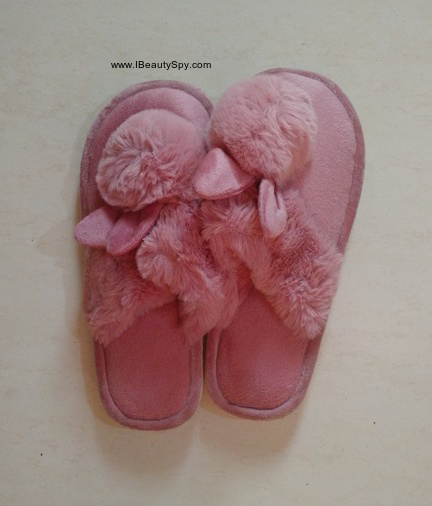 2) Brauch Women’s Fur Bunny Winter Slippers – These are slippers for wearing inside home. I previously got rabbit slippers from some other brand. But currently it was out of stock. So found these rabbit slippers from another brand. They look so pretty, right? And they keep your feet warm and soft. 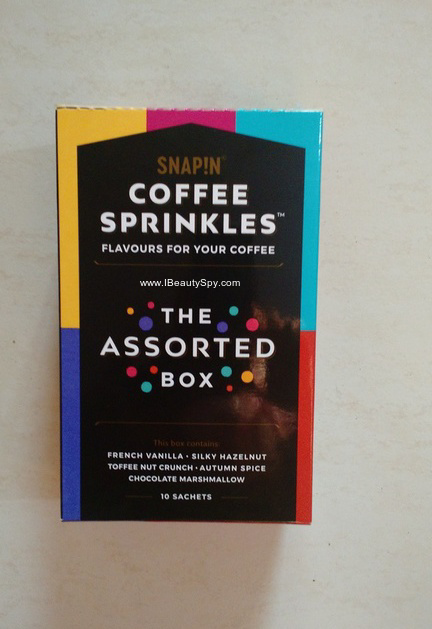 3) SNAPIN Coffee Sprinkles The Assorted Box – I saw an ad for this on Instagram which redirected me to Amazon. I found these coffee sprinkles to be a new concept. These are basically coffee flavors. You can add a sachet to your cup of coffee to immediately get a Starbucks Vanilla Coffee or Hazelnut Coffee. How cool is that! I got the assorted box which has 10 sachets of 5 different flavors – French Vanilla, Silky Hazelnut, Toffee Nut Crunch, Autumn Spice and Chocolate Marshmallow. I really like this new idea of enjoying flavored coffees at home. 4) Opera Salt and Black Pepper Crisp – Chips! Who can resist. I just added this randomly to qualify for free delivery. I liked the mild pepper flavor in it. If you see it in any supermarket, give it a try. Fifth package is my Blend It Raw Beauty Order. Being a skincare enthusiast, certain ingredients call you sometime. Last winters I had this sudden calling for macadamia nut hair care products. Now there was this new ingredient introduced by Aarushi – Butterfly Pea Flower Powder. It is a blue colored flower and the when you make a mask out of the powder it looks blue too 😛. She launched a Bloom Facial Polish using this powder on her other shop Blended Botanica. I had a feeling that this powder was going to do lots for my skin – brightening, anti-aging and what not. Plus its full of antioxidants. But I wanted the pure powder to do DIYs myself. I was asking whether she could get it for me and she was sweet enough to do so. But in case you don’t want to DIY, I would definitely recommend the Bloom Facial Polish which is literally amazing guys! Sixth package is my order from Rzizhi. I have already tried Rzizhi products before and they were so good, so I had to repurchase when they were on offer. I will review them soon here. 1) Just Herbs Sacred Lotus & Green Tea Skin Recovery Infusion Toner – This was on 50% discount. Lotus and green tea sounded good. 2) Just Herbs Marigold & Mango Lip Balm – This also on 50% discount. 3) O3+ Plunge Green Tea Chamomile Face Wash – This on 35% discount. My face wash had got over. I wanted a face wash with green tea for summers. So I got this. First time am trying something from their trending Plunge range. 4) Wild Earth Peach Grapes Cherry Blossom Body Butter – This also on 35% discount. I finished my Plum body butter. Decided to try this since on discount. Peach Grapes Cherry, sound heavenly right? These are the packages that came in my mail last month. Hope you found this post interesting and found some new products helpful to you. If so, comment down your thoughts.